2018 KTM 250 SX. Picture credits - KTM. Submit more pictures. The KTM 250 SX has one of the best power-to-weight ratios in the world of dirt, forming the ultimate fist against more complex 4-stroke rivals. With the grunt to devour all sorts of tracks and terrains, and a lightweight chassis keen to skim the surface, this masterpiece of KTM�s R and D and Motorsport departments is born to lead the next pack of winners that prefer premix. Fuel system: Carburettor. Mikuni TMX. Kokusan EMS. Driveline: 13:48. Primary drive: 26:72. 520 X-ring chain. Ask questions Join the 18 KTM 250 SX discussion group or the general KTM discussion group. Get a list of related motorbikes before you buy this KTM. Inspect technical data. Look at photos. Read the riders' comments at the bike's discussion group. And check out the bike's reliability, repair costs, etc. 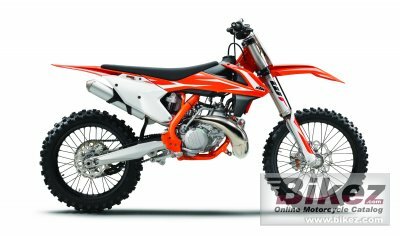 Show any 2018 KTM 250 SX for sale on our Bikez.biz Motorcycle Classifieds. You can also sign up for e-mail notification when such bikes are advertised in the future. And advertise your old MC for sale. Our efficient ads are free. You are also welcome to read and submit motorcycle reviews.